WASHINGTON (CNS) — The bishop who chairs the U.S. bishops’ Ad Hoc Committee Against Racism gave a sobering assessment of U.S. Catholics’ treatment of black people, from the laity to the hierarchy. Bishop Murry spoke at a plenary session, “Church and Communities Address the Sin of Racism in Our Society,” Feb. 4 during the Catholic Social Ministry Gathering in Washington. He recalled a 1983 conference that featured an address by African-American theologian James Cone, then a professor at Union Theological Seminary. “What is it about the Catholic definition of justice that makes many persons of that faith progressive in their attitude toward the poor in Central America, but reactionary toward the poor in black America?” Bishop Murry recalled Cone asking. Bishop Murry was ordained a Jesuit priest in 1979, the same year as the issuance of “Brothers and Sisters to Us,” a pastoral letter written by the nation’s black bishops. The bishops commissioned a 25th anniversary study in 2004, he added, which found much the same to be true. 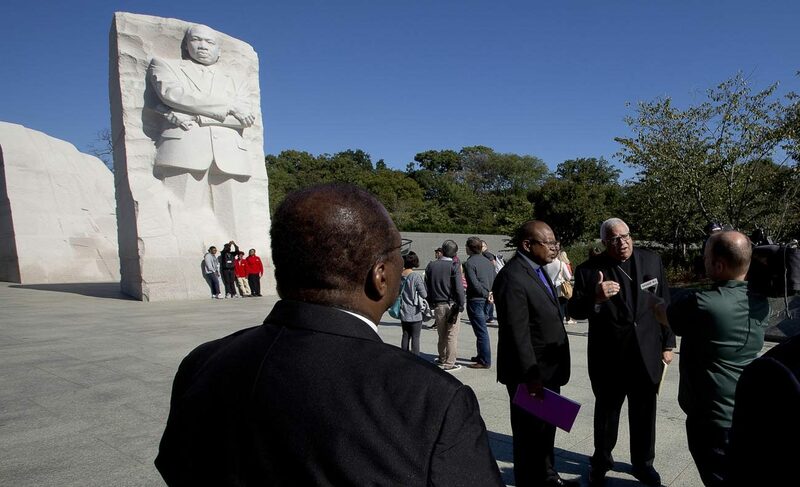 “It painted a disheartening picture,” Bishop Murry said, as “only 18 percent of the American bishops have issued a statement condemning racism, and very few have addressed systemic racism,” opting to focus instead on personal attitudes. The bishop also examined “the attitudes of the early church. The area of slavery is one that has been historically treated with concern by the Catholic Church,” with popes issuing papal bulls condemning slavery. With the expansion of the young nation, “the notion of the complete abolition of slavery was not considered realistic,” Bishop Murry said. Despite the efforts of Daniel Rudd, who published the American Catholic Tribune for black Catholics, and the early lay-led black Catholic congresses to prove blacks as equal to whites, “most parishes remained segregated along racial lines,” Bishop Murry said. Some parishes did not give Communion to black worshippers until all whites had an opportunity to receive the Eucharist. “Some parishes,” the bishop added, “even placed a physical screen between blacks and whites. We can start with Father Augustus Tolton.